The most famous Irish American dish is certainly Corned Beef and Cabbage. It is the necessary dish for St. Patrick's Day feasts all across America. 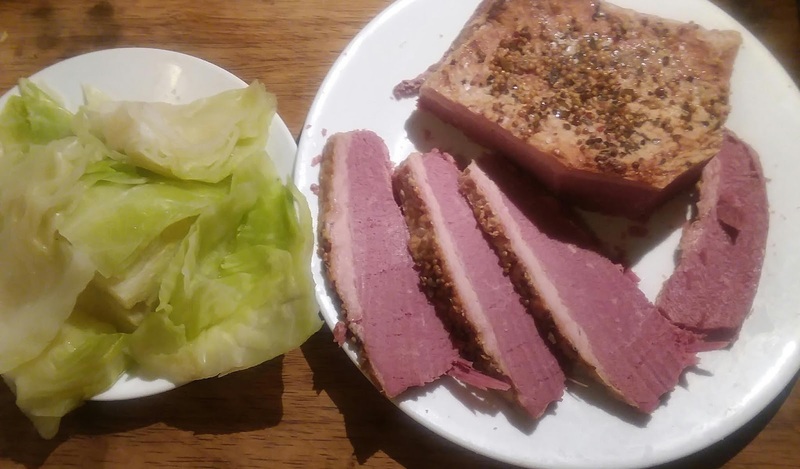 Other Irish dishes may be popular too -- such as Irish Stew, Shepard's Pie, and Irish Potato Soup -- but Corned Beef and Cabbage is THE essential Irish meal. It is to St. Patrick's Day what oven roasted turkey is to Thanksgiving. The only problem is that Corned Beef and Cabbage is not really an Irish dish at all. 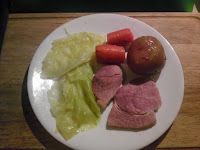 The Irish dish -- from Ireland -- is Cabbage and Ham or Cabbage and Bacon. The Irish bacon is not what we think of in America. It is instead a cut of pork similar to what is called Canadian Bacon in the USA. So, in many way it is like Cabbage and Ham. The story goes like this. In Ireland long ago, the Irish did produce much beef, and thus corned beef; but it was way too expensive for the Irish people to eat. It was for export only. What the Irish could afford was pork products from pigs. In this case bacon and ham. 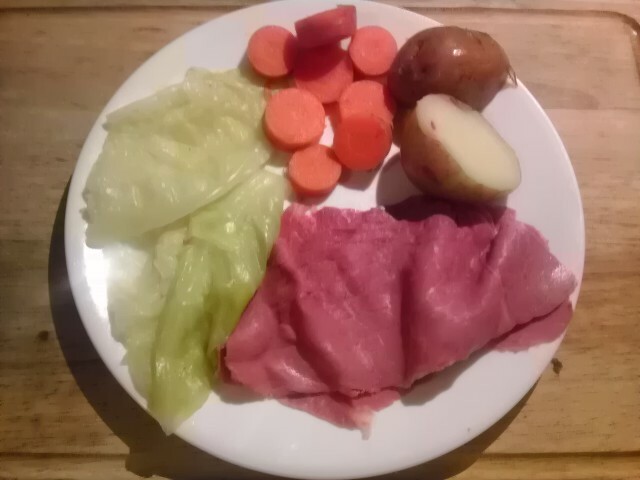 So, in Ireland people would eat ham or Irish bacon (which is like Canadian bacon) and inexpensive vegetables like cabbage and carrots. Potatoes, of course, have a special place and history all their own in Ireland. The potato originally came from South America and was brought to Europe, and Ireland, from transatlantic explorers. Potatoes eventually made up a key element of this dish -- cabbage, ham, carrots, and then potatoes. When Irish immigrants came to America, however, they discovered that beef was plentiful in major American port cities like New York, Boston, Philadelphia, New Orleans, etc. The red color and texture of corned beef made it a perfect substitute for the traditional Irish bacon or even ham. So, the dish Corned Beef and Cabbage evolved right here in America, though it was never really seen in Ireland. With some Oatmeal bread and butter, or Irish Soda Bread, on the side and maybe a pint or two of something cold to drink, who could ask for a better comforting meal? Because of its popularity, no doubt, the US Department of Agriculture composed a special, interesting article and poster on how Corned Beef and Cabbage became a staple American dish for St. Patrick's Day. Here is a public domain copy of the poster below which can be found at this website: https://www.usda.gov/media/blog/2013/03/15/how-corned-beef-and-cabbage-became-holiday-staple. USDA poster, Corned Beef and Cabbage, see sources below. So, when you are dining on a great "Irish" meal, just remember its history and maybe make a second dish of Cabbage and Ham too just for fun. But I will stay with good-ol'-American Corned Beef and Cabbage for St. Patrick's Day or any day I want a good, comforting meal.